Sometimes one pronoun just isn’t enough. A sentence might need both a direct and indirect object, or a reflexive pronoun as well as an adverbial. When this happens, word order becomes an issue: how do you know which pronoun to place first? It’s actually pretty easy, once you learn the rules. Be sure you fully understand how to use each type of pronoun before continuing with this lesson. As you know, object, reflexive, and adverbial pronouns precede the verbs they modify in every tense and mood—except the affirmative imperative, when they follow it (learn more). 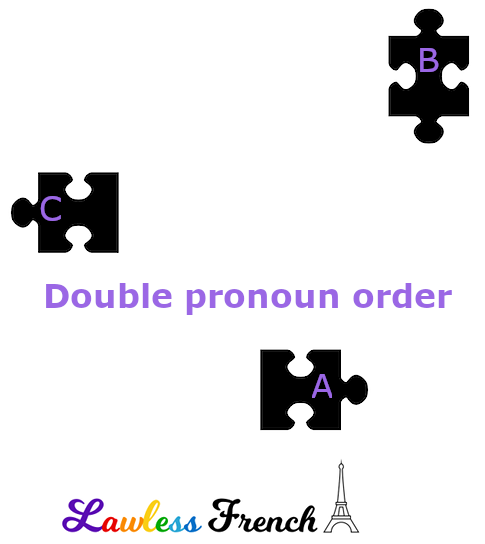 When a verb has double pronouns, they still precede or follow, but the order of the two pronouns themselves also varies. Il me les montre. He’s showing them to me. Je le lui ai donné. I gave it to him. Ne la leur envoie pas. Don’t send it to them. Il y en aura beaucoup. There will be a lot of them. Two pronouns is the limit. The French won’t say something like Je le lui y ai donné to mean "I gave it to him there"; instead, they’ll reword the sentence to remove one of the pronouns. Je lui y ai donné le livre. I gave him the book there. Je l’y ai donné à Michel. I gave it to Michel there. Je le lui ai donné à l’école. I gave it to him at school. 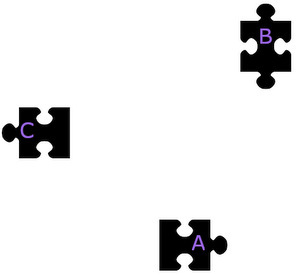 In the affirmative imperative, pronouns follow the verb and are connected to it and to one another with hyphens, in this order: direct + indirect + y / en. Montre-le-moi. Show it to me. Donnons-la-leur. Let’s give it to them. Remember that moi and toi are stressed forms that can only be used when at the end of the command. When they precede y or en, they revert back to me and te and are therefore obliged to contract to m’ and t’. I apologize, but I’m not very handy with grammar in any language. My problem is this: I keep running into sentences that use a pronoun followed directly by another pronoun, with both (seemingly) describing the same subject. For example: <> I understand that sentence to mean, “he is missing half of one ear, and his eyes are…” What I can’t figure out is why the “lui” needs to be there. In fact, I read it as “he him misses (the) half of an ear, and his eues are… .” Could you please try to explain the purpose/structure of such a phrase to me? Your chart for affirmative imperative pronoun order doesn’t cover the case when both the direct and indirect object pronouns are in the same column. For example, what rule covers the following sentence: “Take us to them.” Vous and leur are in the same column. Thanks. This is a great question, it took a bit of research to find the answer. In fact, it’s simply not possible to use a third person indirect object pronoun together with a first or second person direct; the third person indirect object must be replaced by a stressed pronoun. So take us to them = Emmène-nous jusqu’à eux. Source: TFLi, Leur : Lui1, Leur1, pron. pers. I A 2 b) Rem. 3 : Avec un pron. pers. compl. d’obj. de la 1re ou de la 2e pers., à lui/à elle s’emploie à la place de lui, à eux/à elles à la place de leur. Donne-toi à eux, à elles. I think it’s worth mentioning that the rules for the spoken language are the same as for the written one here, *except* for the affirmative imperative. In France at least, it is at least as common to hear native speakers say “montre-moi-le” as “montre-le-moi”, and the forms with collapsed “m'” and “t'” are so uncommon as to verge on the ungrammatical. People say “donne-moi-z-en”, not “donne-m’en”, and many will not even understand the latter. As I recall even so uncompromising a tome as Le Bon Usage admits that you cannot say or write “pousse-t’y” without being ridiculous.